LITANY OF OUR LADY OF SORROWS. Tearful Mother, pray for us. Forsaken Mother, pray for us. Mother bereft of thy Child, pray for us. Mother transfixed with the sword, pray for us. Mother overwhelmed with grief, pray for us. 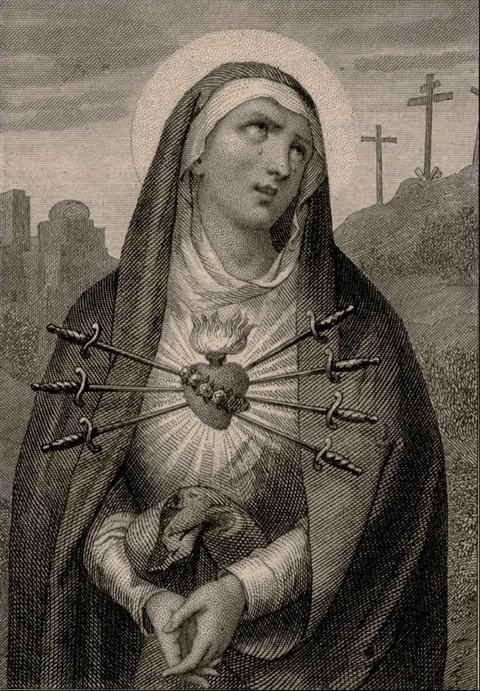 Mother crucified in heart, pray for us. Harbour of the wrecked, pray for us. Look down upon us, deliver us, and save us from all trouble in the power of Jesus Christ. Amen. Imprint, O Lady, thy wounds upon my heart, that I may read therein sorrow and love: sorrow, to endure every sorrow for thee; love to despise every love for thine.